Having already given us the ‘98, ’94, ‘99 and 2000 editions (in that order), HAMSTER now jumps back in time to give us The King of Fighters ‘95. As only the second entry in the series it lacks some of the features of later games, but the aim remains the same: pick a team and defeat a bunch of others on your way to a showdown with a final boss. 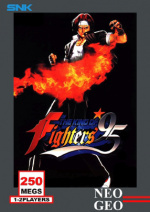 With a good range of fighters to pick from there’s plenty of entertaining team battles to be had here, but inevitably this review will end with a recommendation to download The King of Fighters ‘98 instead. It’s not a completely pointless re-release however. Anyone with a nostalgic interest in this particular instalment will be pleased with HAMSTER’s desire to re-release whatever it can, and for those interested in story this begins the Orochi Saga. There are a few brief and standard scenes during a playthrough, but each team also has their own ending which adds some replayability to the game if you’d like to see them all. The character lineup is very similar to the first game, with seven of the eight ‘94 teams carried over. 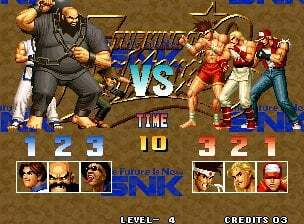 These include the Fatal Fury team and the Art of Fighting team whilst others feature the likes of Kyo Kusanagi, Yuri Sakazaki and huge ball-and-chain swinging Chang. Rugal (or rather “Omega Rugal”) is again the final boss, with Saisyu Kusanagi serving as a new Sub-boss. The USA team hasn’t made the cut, but their spot has been filled by the new Rivals team which includes popular Kyo rival Iori Yagami. Unlike in the first game, you are not limited to the set teams and can put together a fighting force comprised of whoever you wish. This gives you a lot of options to experiment with as you try to find your perfect group of fighters; via some extra button holding it’s even possible to include Saisyu and Rugal in your trio. Combat is smooth and the controls responsive as you perform various special moves and jump or sidestep out of the way of your opponent’s attacks. Sidestepping requires a two-button combination, but by default this is mapped to ZR on Switch controllers. Similarly ZL performs a taunt and holding both Z buttons is the easiest way to charge your power gauge. As always with these ACA releases button settings can be changed in the options menu should you wish to do so. There are some great looking stages in the game, including an outdoor one where the action takes place in a thunderstorm; a tree split by lightning at the battle’s start is burning in the background. Also good is the stage that begins on a lift; the fight initially confined to the smaller space until it has settled into position. The game can get quite tough at times (particularly in the final fight), but becomes easier once you’ve settled on a team and got used to how best to use them. The difficulty can also be adjusted with eight settings available, and as is standard with these releases extra credits are just a button press away. If you’d like a more traditional one-on-one, best-of-three rounds fighting experience this can be enabled in the options menu, although the cutscenes and endings still play out as if you have a full team. 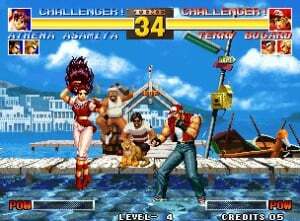 Further ways to play are provided by the usual one credit Hi Score and five minute Caravan modes, and if you are fed up of fighting CPU opposition a second player can of course buy in to the normal arcade mode and challenge you at any time. 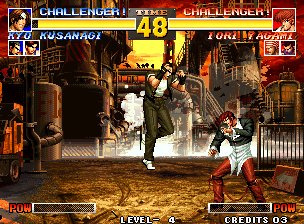 The King of Fighters '95 is a decent fighting game with a good selection of characters to pick from. Figuring out your best team and then battling through either the arcade mode or against a friend leads to some very enjoyable times. Subsequent instalments would improve on the formula, however, and that makes this game a less than essential purchase. 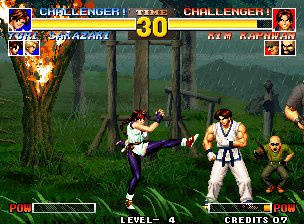 What storyline is in the game will be of interest to some, but whilst it can certainly entertain The King of Fighters '95 doesn't offer as full an experience as The King of Fighters '98; if you are only looking for one KoF game to stick on your Switch, that is the one to go for. Dagnabbit, I'll be grabbing this one at some point. I'm still enjoying Garou. Might get KOF 98 eventually. The damage output is off the charts in this one. Desperation Moves can almost completely wipe out a full health character, as well as a few good normal hits or combo. Good for nostalgia, as stated, but hard to go back to. Still one of the best of the older KOF. I'm glad for releases like this as it gives me more money to spend on some indie games . I've already got the only KoF I'll ever need.This coming Thursday we have Robo Army landing on the Eshop which I'll be buying for sure and the week after that we have Mutation Nation which I'll also be buying for sure. Can't wait to play those 2. That will take me up to 21 Neo Geo games with only 2 of them being 1 on 1 fighters,love them. This time next year I'll probably have more Neo Geo games than all my Wii U games combined. This holds a special place for me as it's PS1 incarnation was my first home KOF experience, but this ACA release is sadly lacking the NeoGeo CD stage music. Those would be a great feature for Hamster to add as an option (where available). Having said that, here's hoping KOF 2003 will get an ACA release sometime in the future. '96 is the best but '95 is good too. Rating is low for this site. Fair for other sites. Odd choice of releases series games in a random order. Surly you'd start with the 1st KOF and work your way up from that, not release older ones later to feel like a step backwards in terms of features and such. Oh look, another neo geo retro game. @Captain_Gonru True. I like classic KoFs more and this '95 was good. They were good up to '98 (included). Why are we getting so many Neo Geo ports? What kind of weird deal did Nintendo make with this company? I don't really mind, but these games don't look to interesting for those of us with no nostalgic ties to them. Not a fan of these Neo Geo games as I'm all for looking forward. With any luck we won't see too many more once 2018 rolls around, though I'm happy for those who enjoy them. @Agramonte You know that PS4 and Xbox One are also getting a Neo Geo game practically every week, it's not just a Switch thing. The other consoles have been getting them since before the Switch even came out. Then before that it was the Arcade Archives releases each week, although those were just for PS4. You better get used to it as they'll keep on arriving each week for at least another 18 months, probably more, then we'll be getting those Arcade Archives releases. I mentioned earlier and those are plentiful. Hamster have already said what their plans are months ago .I'm not sure why it's an issue or something to complain about with some folks if one is not interested in buying a retro game then ignore it, it's not as if the Switch is struggling for games each week or that it's even a new thing for Nintendo fans. We've only been getting retro games on.weekly basis since 2007. After 98' this is my favorite KOF, I really hope they will release the 96' one too! The 94' , 95' and 96' had the best sound tracks and stages in my opinion. Just the 96' missing now to complete my collection of favorites! @OorWullie I really wasn't complaining, I just don't understand the reason. @Heavyarms55 That part wasn't directed at yourself or the other member, just the reason why we're getting so many part. @OorWullie But there it does not matter - for every retro pixel art game you get something to balance out from Hobs to Cuphead at the same pricepoint. You don't get +60% games dumped on their shop in a week as pixelart. No difference as if I go to my Cineplex and half the theater are old 1920 revival films - you get sick of it. Right, so I guess you must blown a gasket when everyone here wrote 200+ comments complaining and moaning about SE and Secret of Mana last week. I didn't, I don't come here thinking everyone needs to just be happy with everything. Or you only post when you agree. I don't... I just wait for Battle Chasers, HollowKnight, Flipping death, A hat in Time, Plague Road... and the time when the eShop will be more balanced. I'll support companies that are trying on the Switch - not just dumping 25 year old "as-is" code on the eShop. @tourjeff I will buy only the '96. No real need for other KOFs. Still '94 is underrated.